What is the one Ohio furniture store that carries beautifully crafted furniture that is hand-made by more than 70 Amish families? This store is Amish Originals Furniture Co., located in Upper Westerville, and it has been serving northeast Ohio residents since 1992. Here you will find a huge assortment of items to furnish every room in your home, including storage items and decorative items that will add that special touch to make any room your own. We spend a lot of time in our bedrooms. In fact, we usually spend a minimum of six to eight hours sleeping, not to mention the time we spend in there getting ready for work, watching television, reading and more. This is why you should have furniture that you feel comfortable in. After all, if you are going to be spending so much time in one room, you may as well make it as beautiful and comfortable as possible. At Amish Originals, the Ohio furniture store that has the best in Amish furniture, you will find a great selection of items to furnish bedrooms for every member of your family, including babies. There are many styles of bedroom sets that include bed frames, dressers and night stands, as well as cedar chests for blanket storage, shelving and other beautiful storage units. One of the other rooms in your home that gets used a lot is probably the family room, so it is important to make sure that you have lots of comfortable furniture for everyone to use. At Amish Originals, you will find plenty of great chairs and sofas, and even chairs for the smallest members of your family. Everyone can be comfortable when you have items that come from the Ohio furniture store with the best Amish-made furniture. DonÕt forget about storage too, as well as a great-looking entertainment center, which you will find in the showroom. When you shop at Amish Originals, you will even find beautiful furniture to decorate your outdoor space. You can choose from furniture made from treated pine or poly lumber, and of course you know that it will be made with the loving care that only the Amish can provide in their craft. You will find a large assortment of tables, chairs, swings and more items for your yard or deck, all made from the finest hardwoods in the United States. You will only find this type of quality when you shop at the furniture store Columbus Ohio that customers have trusted for over two decades. Whether you are looking for indoor or outdoor furniture, there is only one Ohio furniture store that has everything you want, at prices you can afford, and items that are Amish-made and built to last. 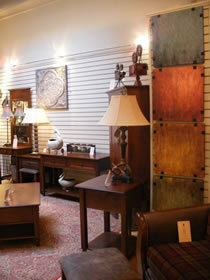 That store is Amish Originals Furniture Co. in Westerville, and it is just a short drive from your home. Visit the showroom today and find just what you need to furnish your home, and know that you are buying furniture that has been built to last a lifetime.